← What is an MSDS Sheet? 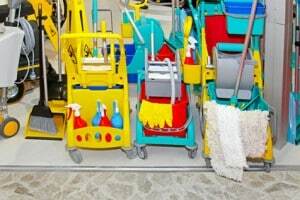 Many businesses use too much of their cleaning products and supplies to do simple jobs. Products have dilution ratios, which clean a variety of surfaces using as little as one capfull per gallon. Properly cleaning using the manufacturer’s suggested dilution ratios saves you money. Employees don’t understand the dilution ratios and frequently use much more product than required, thinking it will assist in getting surfaces cleaner and require less work. Not only do dilution ratios save money, they do a better job on specific surfaces. Most floor cleaners are best used with hot water and the dilution ratio recommended by the manufacturer. Using too much of the cleaner can cause streaks, especially on specific floors types, such as marble and hardwood floors. Diluting the product using Worldwide Janitor’s All-Purpose Neutral Cleaner, allows you or your employees to avoid cloudy-looking floors and streaks. It also assists in stripping and waxing floors. Using too much product makes stripping and waxing floors a much bigger task, because you have to remove more product from the floors during the stripping process. Stripping and waxing products are generally more costly. It also requires using separate mops and other costly equipment. If the floor cleaner is diluted properly each time it’s used, other tasks related to cleaning floors will be easier and less costly. Most cleaning clients don’t require extensive window cleaning. Many clients only ask that janitors wipe smudges and fingerprints off of windows, mirrors and glass surfaces. Some clients require extensive window cleaning, but often use a professional window cleaning service for the job. Businesses specifically related to window cleaning require dilution ratios to properly clean windows. Dilute our Streak Free Non-Ammoniated Window Cleaner with water and use the 18″ Heavy-Duty Moss Squeegee to clean windows. You can use the Streak Free Non-Ammoniated Window Cleaner with a paper towel or a lint-free cleaning cloth on surfaces like mirrors. Simply dilute the product as directed to save time and money. Ensure your employees are using minimal supplies, such as paper towels. After surfaces are sanitized, you want them to sparkle. Using a few paper towels can accomplish that by cleaning mirrors first, then using the same paper towel with the window cleaner on sinks and other surfaces to make them shine. The life of products such as mop, floor dusters, brooms and cleaning cloths can be extended with proper cleaning and care. Ensure employees always clean mops after each use. This requires a small amount of one of our bleach products and filling the mop bucket with clean water. Allow the mop to soak in the bleach and water for a few minutes, ring it out aggressively and then rinse the mop in a bucket of hot water. Ring the mop out again and store it where it can dry. Brooms can be easily washed by rinsing them off. To sanitize the broom, simply soak it in a sanitizing product, diluted with hot water. Wash polishing cloths and cleaning cloths separately using sodium hypoclorite bleach product, like our Pure Bright 6%, Sanitizing Bleach. Because polish contains oil, it’s better to wash those cloths separately from standard cleaning cloths used on other surfaces, such as bathrooms and countertops. Also wash dust mops with the cleaning cloths to ensure they stay clean, which extends the life of the dust mops. Never use fabric softener when washing any cleaning cloths. Using fabric softener coats the cleaning cloths and doesn’t allow them to clean properly, especially on windows and mirrors. A small amount of the bleach and our HTD Heavy Duty Detergent allows cleaning cloths to maintain their integrity. Dry the cleaning cloths and dust mops in the dryer to remove excessive lint. Employees generally don’t understand dilution ratios. They often overuse supplies, which includes cleaners and other products, such as paper towels. Keeping supply costs down allows you to give raises to employees that follow your specific instructions regarding dilution ratios and how to use other supplies properly, whether or not your client pays for the supplies. It also makes your clients happy because it keeps their costs down. Explain your money and product saving tips to your clients, especially if they supply some items for you to use. Ensure they know their facilities are properly cleaned, but you’re taking steps to assist in lowering their costs. Worldwide Janitor provides bulk pricing. Each of our products provide specific dilution ratios for the products that can be diluted. Even our organic products provide instructions on how to dilute them properly. Some are concentrated to allow you to use it a small amount with water. If you don’t provide the products to your clients, suggest they call Worldwide Janitor to receive the best prices and products available. Most of our products are shipped within 24 to 48 hours. This entry was posted in Bathroom Maintenance, Dust Control, FAQ's, Floor Care, General Cleaning, Green Cleaning Products, Janitorial, Laundry, Uncategorized and tagged 18" Heavy-Duty Moss Squeegee, All-Purpose Neutral Cleaner, Daybright Bleach, HTD Heavy Duty Detergent, Streak Free Non-Ammoniated Window Cleaner. Bookmark the permalink.